I’ve just returned from a few days work in Dubai, attending a massive event on the future of government (an interesting meeting despite the absence of any talks on mammals). I was able to spend a few hours looking for wildlife too. I’d visited the UAE once before, in 2007, on a 24 hour lay over on the way to Yemen. An ill-fated attempt to go spotlighting ended in under two minutes when I got my Humvee rental stuck in the desert. I spent the next two hours digging it out. 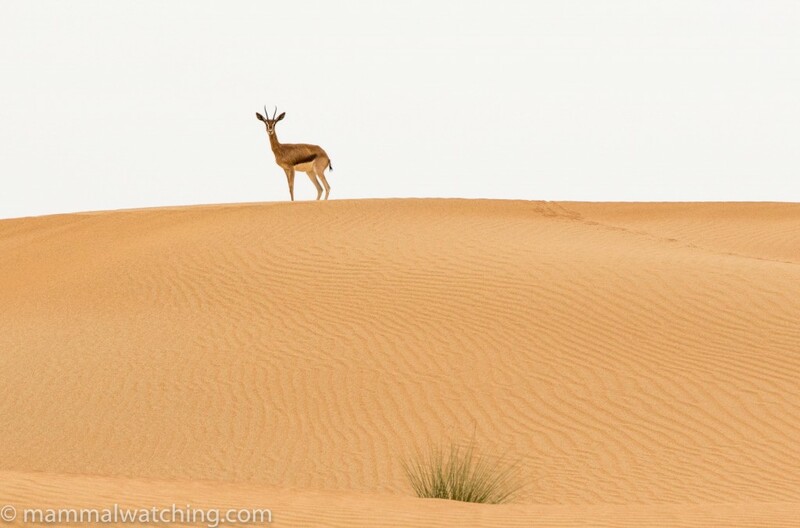 This time I was determined to do better, and so I contacted the Dubai Desert Conservation Reserve (DDCR) ahead of time and struck gold when I emailed the fabulous Tamer Khafaga there. 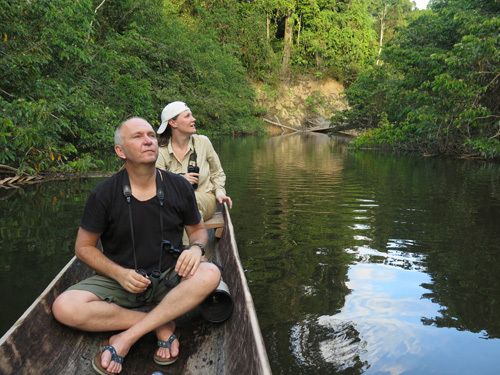 A really great guy who couldn’t do enough to help me find some mammals. The DDCR was formally set up in 2004, comprises a little under 5% of Dubai, and is one of the best protected areas in the emirates. 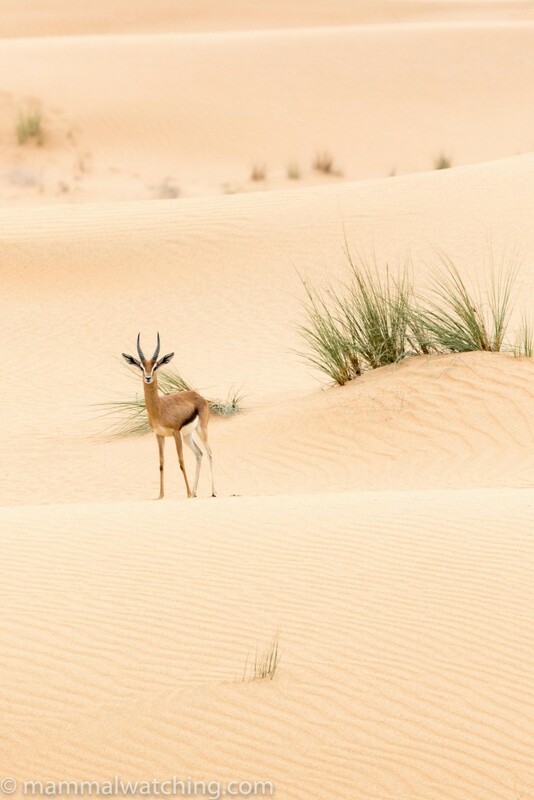 It is well looked after, in part because Dubai’s Emir, Sheikh Mohammed bin Rashid Al Maktoum, has an affinity with the area: he spent time there as a young man and returns often, presumably to enjoy the oryx and gazelles that have been reintroduced, as well as the desert itself which is in much better shape than land outside the reserve. The reserve is about an hour from Dubai City and Tamer, a botanist there with a general interest in everything, was kind enough to give me a guided tour when I arrived. 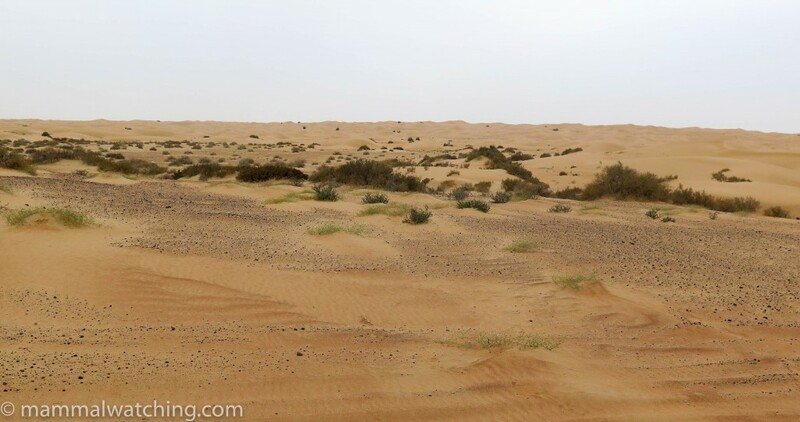 He has worked in the reserve for 10 years and has watched it recover after decades of overgrazing from camels and dune destruction by four wheel drives. It is a beautiful spot, which encircles the fancy Al Maha Desert Resort (where Bob Berghaier stayed a few years ago). For more information check out their web page. Tamer drove me around the reserve early one morning for a couple of hours so I could see the dunes and the gravel plains, the two habitats in the area. 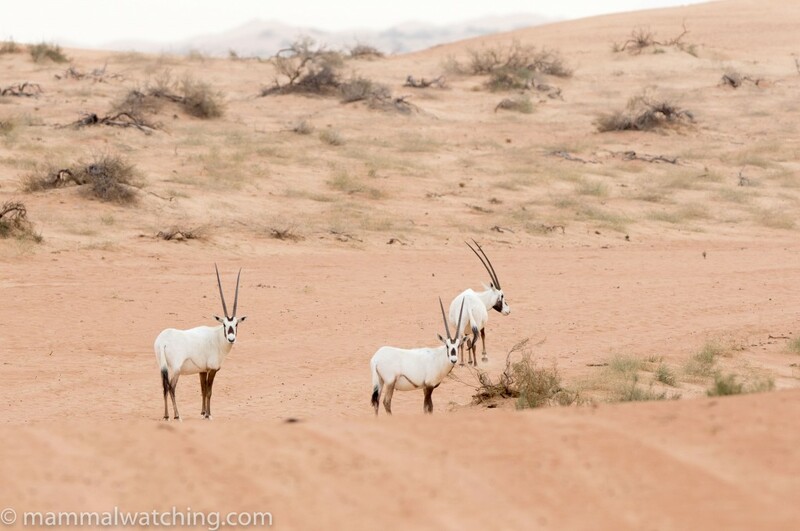 We saw dozens of reintroduced Arabian Oryx. 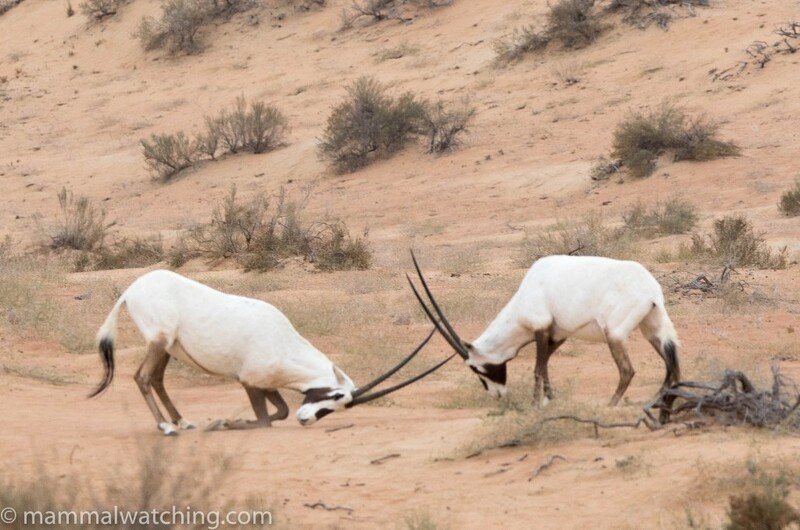 Although these animals are some way off from being wild (Tamer described them as “semi-domesticated”), and exist in the reserve under artificially high population density, they are still wilder than other oryx I’ve seen and it was a real pleasure to watch the interaction among the animals including these two young males having a bit of a scrap. 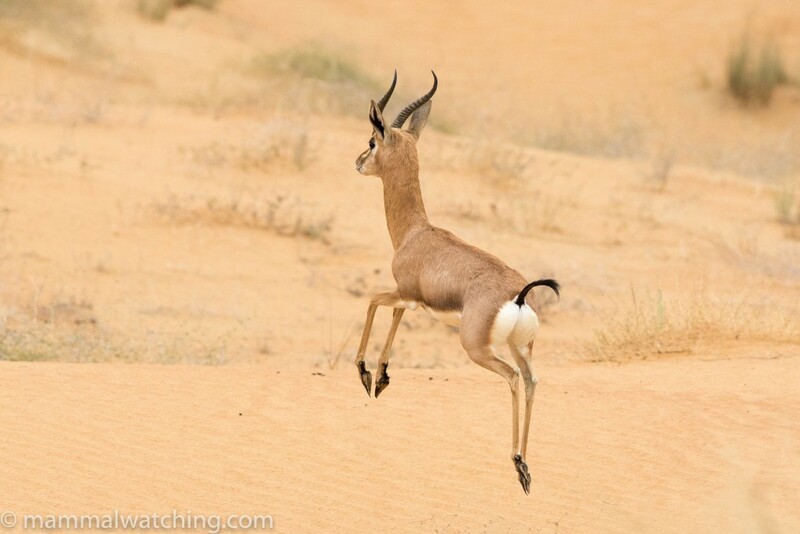 We saw just one pair of Arabian Sand Gazelle in the south of the reserve, and they were particularly wary. 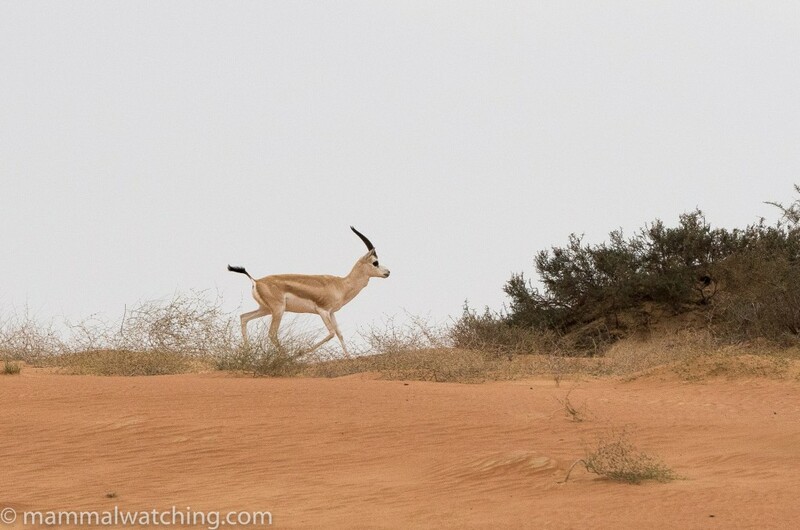 The elegant Arabian Gazelles were rather more common and we saw some near to the Al Maha, and more in the south of the reserve. They can be seen elsewhere in the UAE, including along the highway between Dubai and El Ain occasionally. It had been a while since anyone had trapped for rodents in the reserve, and Tamer was happy for me to set a few traps overnight so long as I didn’t drive off road. Last year had been a good rain year: “good” in Dubai means they had had a solid two hour downpour in March! But it was good enough to foster some solid vegetation growth, which in turn generated a bit of a boom in the rodent population. I was back before 0500 the next morning and the rodent activity was prolific. During an hour’s spotlighting I saw dozens of small mammals running around. 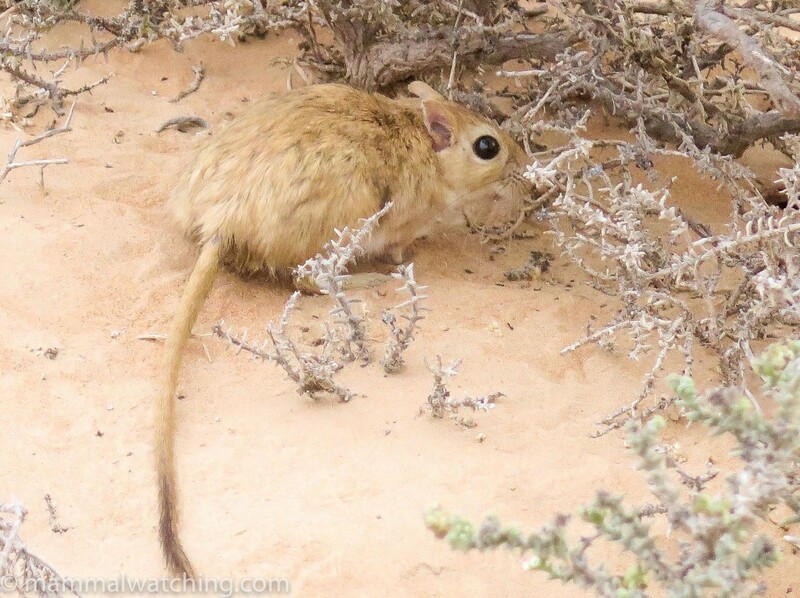 Most were moving too fast to get a decent look at but were likely Cheesman’s Gerbils, though I also saw one Arabian Jird, a Lesser Egyptian Jerboa and almost certainly a Baluchistan Gerbil or two. My traps were also overflowing: I had a greater than 50% success rate, with the best results in the dunes by the gate about half way along the entrance road (between the main gate and the Al Maha Hotel). 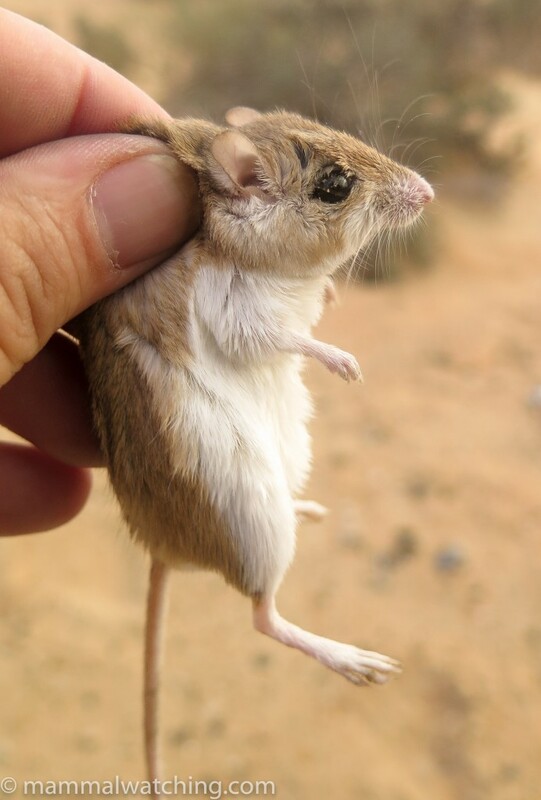 Cheesman’s Gerbils made up the majority of captures in both the dunes and the stony planes. 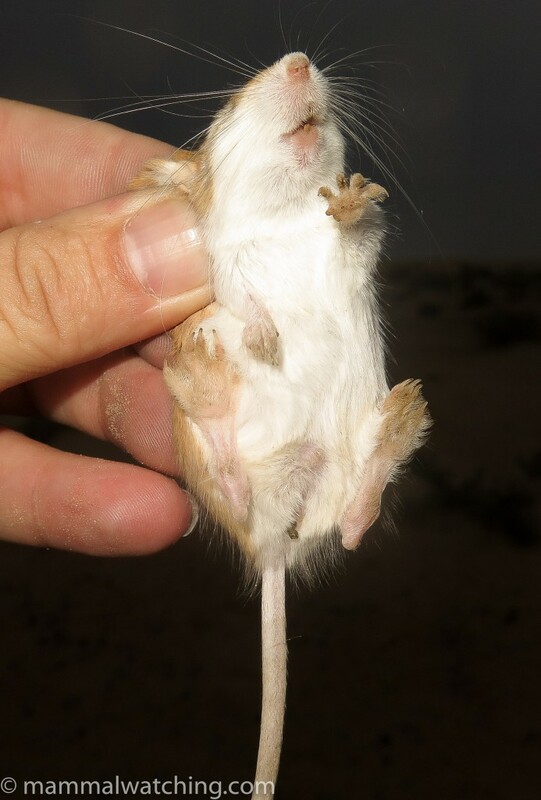 These pretty gerbils are easily distinguished from the other gerbil species on the reserve, Baluchistan Gerbil, by their hairy soled feet. 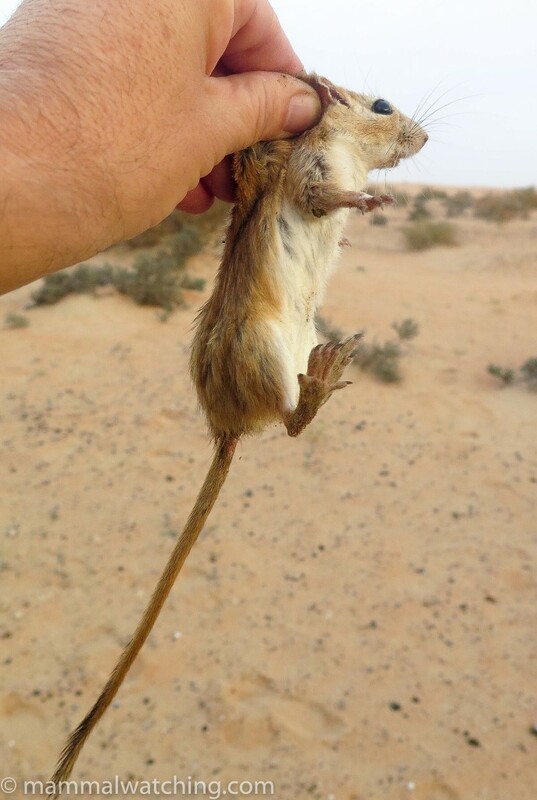 I caught only two Baluchistan Gerbils (compare to about 15 Cheesman’s) and they were in the dunes near to the gate I described above. They are somewhat drabber than the reddish Cheesman’s. And the naked soles of their feet are completely different. Both gerbils were new for me. My other target on the reserve were the Arabian Jirds, which I was told were rather less common (indeed one night tour operator told me he had not seen a jird in 10 years on the reserve). I saw one within two minutes of arriving, in the dunes near to the entrance gate at around 5 a.m. I caught another in dunes near to some trees (at the site described above). They are robust animals and I reckon I might have captured more had I been using larger traps: all but three of my traps were the smaller size Shermans, and the only jird I caught was in one of those three larger traps. Delighted with my haul I stopped by the office to thank Tamer again and returned to the conference. 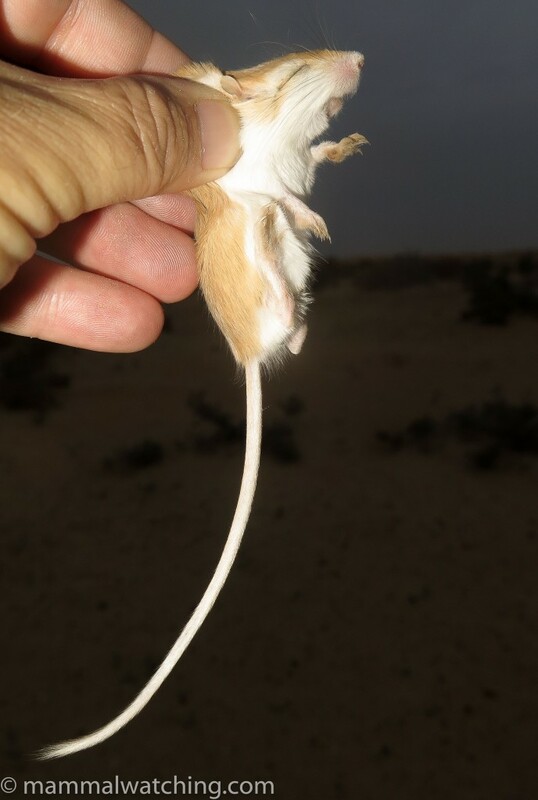 There were a few other species in the UAE that I was keen to see including Brandt’s Hedgehog (apparently rare) and some bats including Desert Long-eared Bats (Otonycteris hemprichii) and Muscat Mouse-tailed Bats (Rhinopoma muscatellum), neither of which I was able to get much information on. 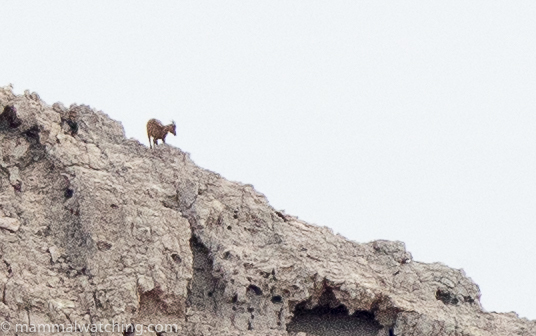 I had ruled out even trying to see an Arabian Tahr, a handful of which seemed still to be clinging on on a mountain or two. Thankfully – and coincidentally – Paul Carter dropped me a note while I was in Dubai, causally mentioning he had seen on a few years ago in Abu Dhabi. I changed my plans! 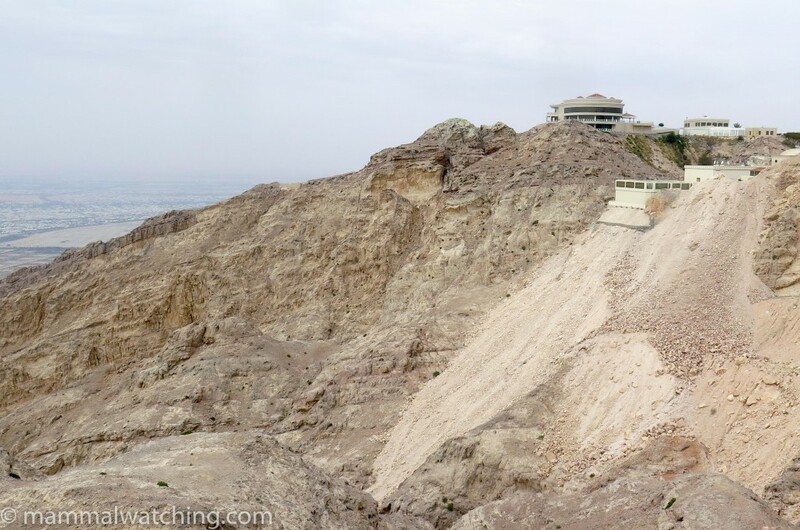 I spent my last afternoon on Jebel Hafeet, a well known mountain near the town of Al Ain in Abu Dhabi. A road runs up the mountain for eight kilometres or so to the Mercure Hotel, near the summit. Paul saw a Tahr near the hotel in 2011 and I found two or three reports from birders who had seen animals up there since them. I spent several hours at the summit scanning the ridges from the hotel garden, and from the road further up towards the summit. The best vantage point I could find was from the south side of the hotel, above the Al Khyama restaurant that is near to the pool. Just before 1800, and just as I was about to leave, I spotted an Arabian Tahr coming over a distant ridge, shortly followed by a second. 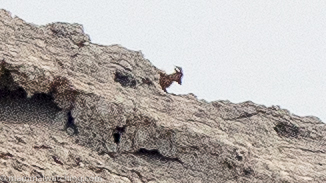 The images below are highly cropped, though not all that bad when you consider the animal was around a kilometre away. A distant sighting but a thrill to see this endangered species. Only one or two thousand remain, and animals largely restricted to the mountains of Oman. 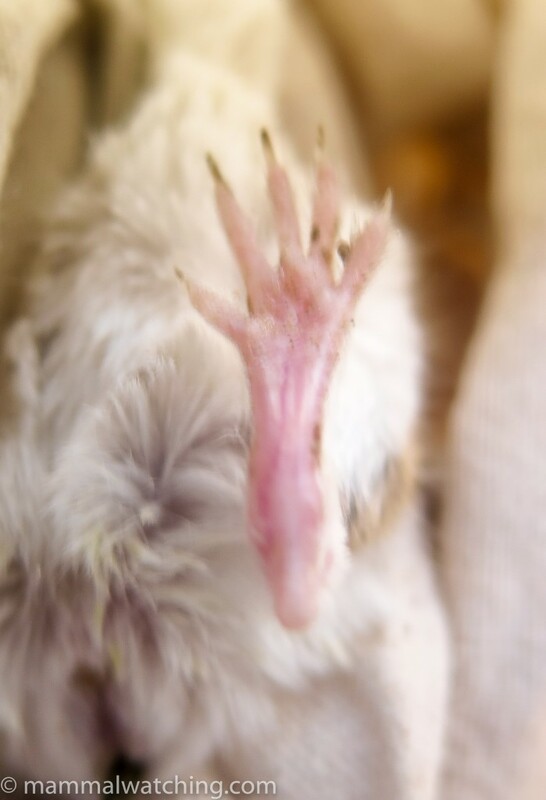 Indeed the IUCN’s Redlist describes this species as possibly extinct in the UAE. I spoke to one of the hotel staff who said he hadn’t seen one in 5 months or so, though I am sure he hadn’t been looking. My guess is that this is a pretty reliable site for this species if you put a few hours in, preferably with a spotting scope. And with that I jumped back in my car and drove the two hours back to Dubai, and the long flight home to New York. Mammal watching in the Carpathian mountains.